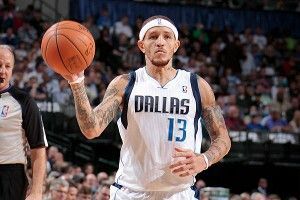 You can break Delonte West’s fingers and it will only make him stronger. Or at least more resolute in going to his left. If you’ll excuse me, I’m going to go work on a spec script in which Delonte West plays the one-armed man in a remake of The Fugitive, with Vince Carter as Dr. Richard Kimble. E-mail me at BlockbusterIdeas@Hollywood.com if you are interested in buying this, sight unseen, for 1 billion dollars.